meeting little e for the first time. cupcakes 5-year-old bash. lots of kisses for aevy. spending all day in my pj's with bek. walks to the park. stories from cupcake. jokes from michael. yummy meals. driving the wrong way down a one-way street. getting lost in the coolest part of down-town portland. dinner at the original. goodwill and gap sprees. the hawthorne district. and lots of relaxing. i auditioned on tuesday! this is the second play i've ever auditioned for so i'm crossing my fingers for any part. i'd be happy to be singing behind a door. i picked this picture for three reasons. one: i liked the lighting, i'd been messing with some settings i don't usually use, and i was pleasantly surprised. two: it fit the "i felt so tall-monkey arm" thing, notice the sleeves aren't long enough? 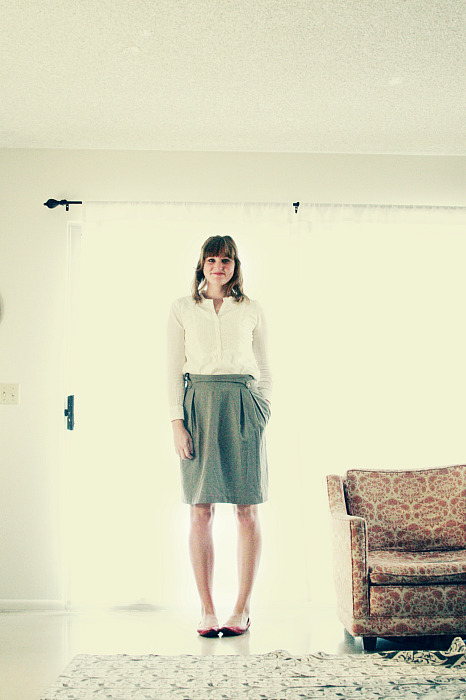 three: the shirt and skirt were thrifted! hooray!